Outside of their music, another appeal of The Clash to my young eyes was their over-all aesthetic. Encouraged in their early days by manager Bernie Rhodes, the army surplus and leather jacket stylings gave a rebel stance that became emblematic, and spawned many a teenage lookalike. This defined punk fashion in many immotators eyes, not least myself in my late teenage years. In their graphics, their evolving visual language of distressed or stencil typography, saturated revolutionary reds and military greens, heavily posed photographs, and knowing reggae and hip-hop reference points, formed an aggressive identity that flirted with insurrectionary fervour. The influence of this has been utilised by many a marketeer in the last 20 years, and you see their graphic stylings on anything nowadays that is trying to look slightly edgy, urban and rebellious, from skateboard magazines to energy drinks. Mainstream ‘alternative’ would be an apt description and the ‘making money out of rebellion’ Strummer quote rather obviously comes back to haunt his memory. 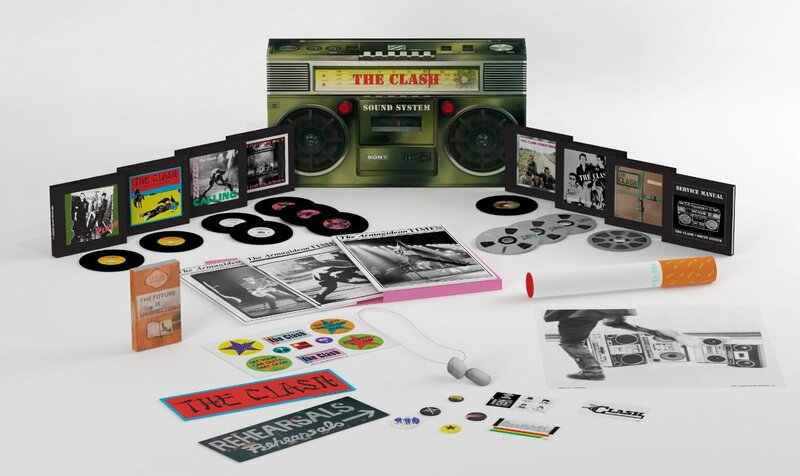 When I heard about the proposed release of Sound System, a box set of Clash material due to hit the shops this September, nostalgia got the better of me and I searched it out online. I was expecting to be disappointed, a feeling that nostalgia often promotes—stripped of any contemporary relevance and promoting a sense of longing for something that can never be again. However, disappointing is too weak a word for what I found; as I looked at the pre-release marketing shots and promo videos I was gob-smacked by how truly awful this looked. The ‘boom’ box container is the first thing that grates. I can’t even think where I would keep this in my house if I owned one, I certainly wouldn’t want it on show. Ugly and cheap are words I try to avoid when discussing design, but I’m afraid I can find no better ones to articulate here. Then there are the contents—stickers, dog tags, a poster presented in a giant cigarette tube, badges, more stickers—gimmick after gimmick thrown together on a whim with little thought to consistency or sophistication. Childish, naive, and verging on being patronising, it is if Sound System is aimed at the average 14 year-old punk new-bee rather than ageing Clash fans with the disposable £111 to spend on it. If this project was just down to record company excesses trying to make a quick buck in a dying industry, then I could almost excuse it, distancing as it would the product from the band. But to know that Mick Jones and Paul Simonon have been involved in designing this is disheartening, as it does a real disservice to The Clash’s legacy. I can’t believe that Joe Strummer isn’t turning in his grave.